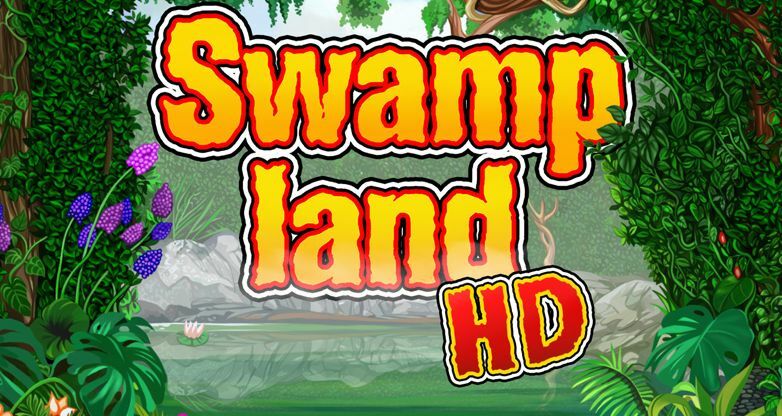 Swamp Land is a classic slot by MainamaGames. The game has 10 paylines. Payments are made when three or more matching symbols come, starting from the first reel. But this is just a beginning! You can always double your win.If fortune smiles upon you, the frog will catch the flying arrow and then the prize will double. 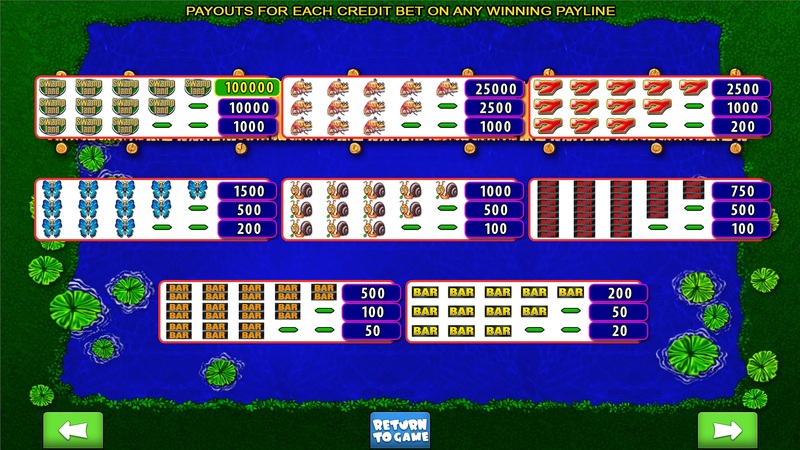 When three symbols of the frog appear on the reels, the bonus game is triggered. 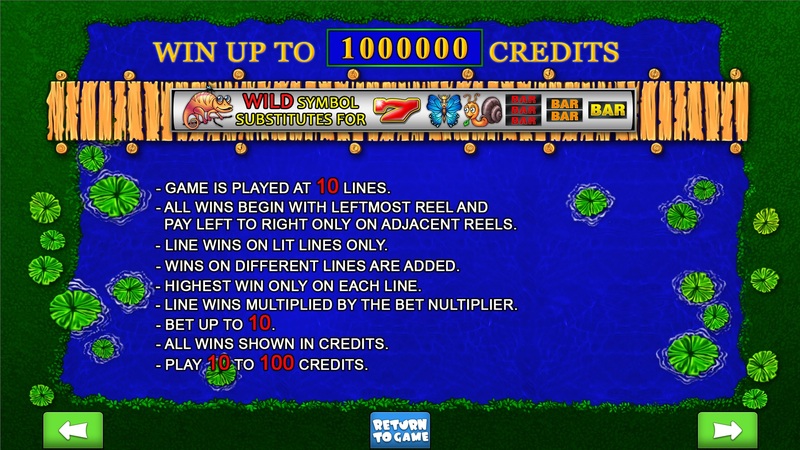 In the first level you are to help the frog to leap over four rows of water lilies without getting caught by the crocodile.For every successful leap you win a prize. If you start the bonus game playing for maximum stakes, the frog will wear a crown and it enables one miss. When the frog gets into the water instead of the water lilies, the crocodile won’t be able to catch it. The frog will only lose the crown, and the disappointed crocodile will have to retreat and lie in wait for us in another place. 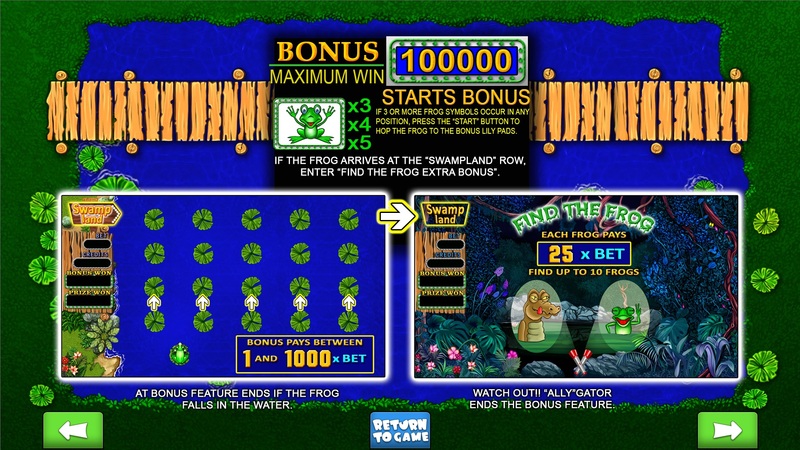 When the frog gets to the last row of the water lilies, you gain the second bonus game! Yes, you haven't misheard! The bonus game has another bonus game! You need to guess where in the dark the frog is hiding without coming across the crocodile. In the night forest you only have a torch and a pair of eyes watching you from the darkness. Direct the torchlight and get to know who is hiding behind them! If the frog is found in the light of your torch, you get the prize equal to 25 stakes! And this is not the end of it! 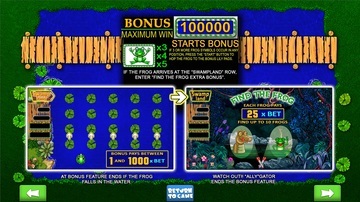 After you have guessed where the frog had been sitting, the bonus games starts from the very beginning! But if in the beam of the torch our old toothy friend is found, the bonus game will be finished. Want to know more? 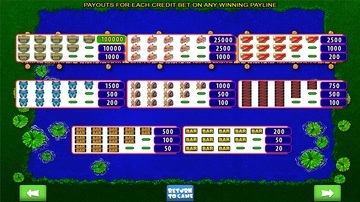 Play Swamp Land and may the luck be with you!